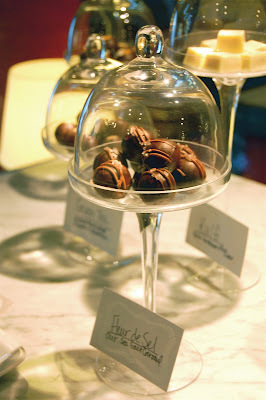 J. Chocolatier's truffles are displayed on pretty glass pedestals. In the Georgetown rowhouse that formerly housed Chez Mama-San, Jane Morris recently opened her first J. Chocolatier retail store, after doing wholesale in the DC area for almost three years. Morris, who trained under renowned chocolatier Fritz Knipschildt before starting her own business, creates artisanal truffles, caramels and toffee. I recently picked up a box of four truffles, including a delicious fleur de sel caramel with an oozing center and a spicy clove truffle topped with cocoa nibs and a hint of ancho chili. The shop offers a rotating menu of 14 handmade truffles, some baked goods and Caffé Pronto coffee using a pour-over bar. Morris is adding Parisian-style drinking chocolate this weekend, and there are a handful of tables for hunkering down to enjoy the sweets. *Free food alert: Stop by the store on Friday, Oct. 16 from 6:30 to 9 p.m. for a free tasting featuring samples of the warm clove truffles, fresh pumpkin truffles, fleur de sel caramel and drinking chocolate. 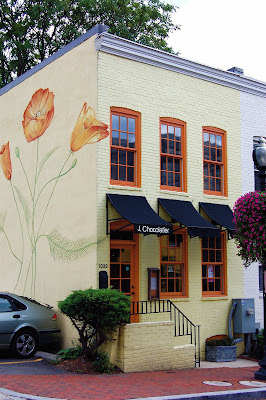 J. Chocolatier is located at 1039 33rd St. NW. But when do they open for business? Is the 16th their launch? The shop is already open.